Did you know that more than 120 medical conditions can be detected in your mouth? Anything from measles to cancer, blood diseases to bulimia can be detected in the mouth. In fact, for many years, associations have been reported between the health of the mouth and medical conditions. One such association is with diabetes and periodontal disease (also known as gum disease). An estimated 33.3 million Americans have diabetes, and there is a national concern over the number of new cases each year. As you may know, diabetes is when the body’s insulin production is impaired, which causes a person’s blood sugar level to be high. Diabetes reduces the body’s ability to fight infections. Because of this, diabetics are at higher risk for developing infections, including gum disease. Gum disease is an inflammation of the gums and bone around the teeth. If left untreated, teeth may be lost and inflammation can spread throughout the body. Research suggests that the connection between gum disease and diabetes goes both ways. Inflammatory diseases such as gum disease can make it hard to control blood sugar levels and therefore hard to control diabetes. 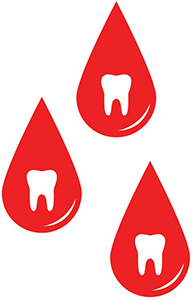 At the same time, if your diabetes is uncontrolled, then managing and healing from periodontal disease is difficult. If our mouth is not healthy, we are not healthy. This is especially true for diabetics, for whom it is particularly important to visit the dentist regularly and to maintain a good oral health regimen. Learn more about gum disease here.